The Skinny: Modern-day action eye candy from Ching Siu-Tung that features nifty costumes but a confusing and uninteresting story. Some decent action helps but the lack of any urgency renders the film a curiosity. by Kozo: Ace action director Ching Siu-Tung brings us this wacky modern-day actioner which features Michelle Yeoh and really not much else. The Wonder Seven are a group of motorcycle-riding heroes who were all orphans back in China. Now working for the Chinese government, they get sent to Hong Kong to catch some nefarious baddies who are responsible for the theft of bunches of money. 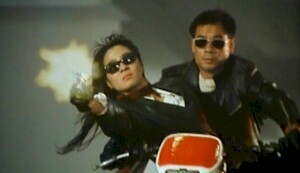 One of the bad guys is actually Yeoh, who wears cool shades and dresses in nifty outfits reminiscent of the seventies. She flirts with Wonder Seven's leader, played by the charisma-lacking Li Ning, and eventually questions her loyalties, which is really no surprise. Hey, this is Michelle Yeoh we're talking about.